The CLARiiON AX100 brings you all the benefits of networked storage - consolidation, automation, and advanced data protection - all in a powerful and economical solution. CLARiiON AX100 extends the proven CLARiiON architecture, providing integrated functionality and ease of use at an entry-level price. If you're looking for a cost-effective way to get into networked storage, it's here. CLARiiON AX100 features a compact, efficient hardware design that incorporates up to 12 Serial ATA (SATA) drives in a 2U (3.5") rack-mountable enclosure. 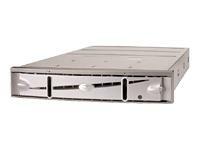 A single AX100 array provides capacities ranging from 480 GB to 3 TB.